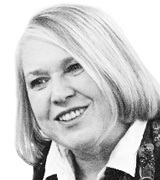 Feminism today: What does it mean? August 01, 2014, 4:10 p.m.
Women are more than twice as likely as men to say they are feminists at first, although only a third of women describe themselves that way. The gap remains about the same when people read the dictionary definition. 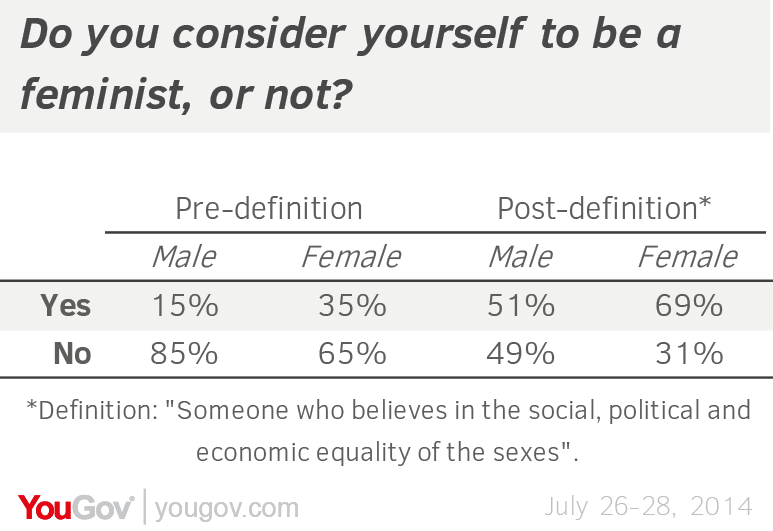 Once that happens, identification increases dramatically: half of men and two-thirds of women say they are feminists. 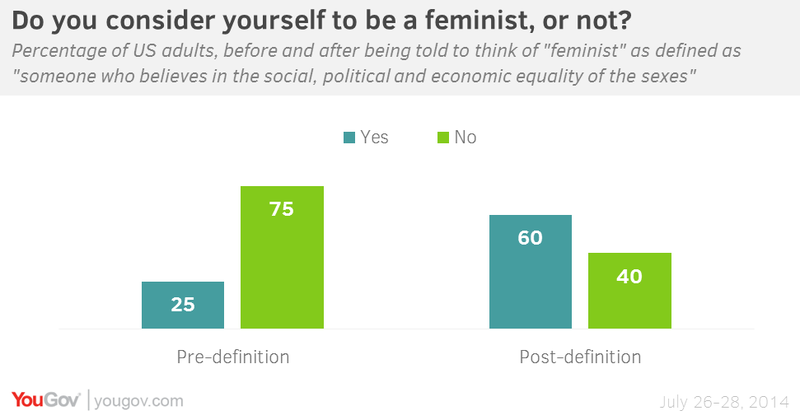 There are some groups whose members reject the feminist label: 58% of all Republicans say they are not feminists even after seeing the definition. 62% of GOP men say they do not agree with the definition of feminism. So do 46% of GOP women. Women under 30 seem to have embraced the term – even without a definition. 51% of women under 30 call themselves feminists. So do a majority of higher income and college educated women. 70% and more in those groups say that after reading the dictionary definition. For many others, however, the term “feminist” is an insult. One in four adults say it is. So do one in three Republicans (40% of GOP men say this). Just 14% overall say that calling someone a feminist is a compliment. Most Americans think it is just a neutral term. Even those who identify as feminists themselves are divided on whether the term is a compliment or just a description. 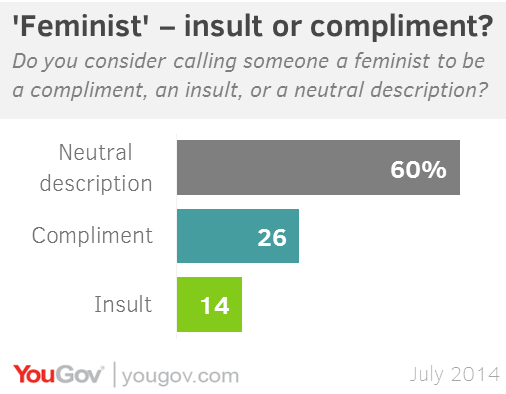 44% of feminist women say it is a compliment; 52% say it is neutral. 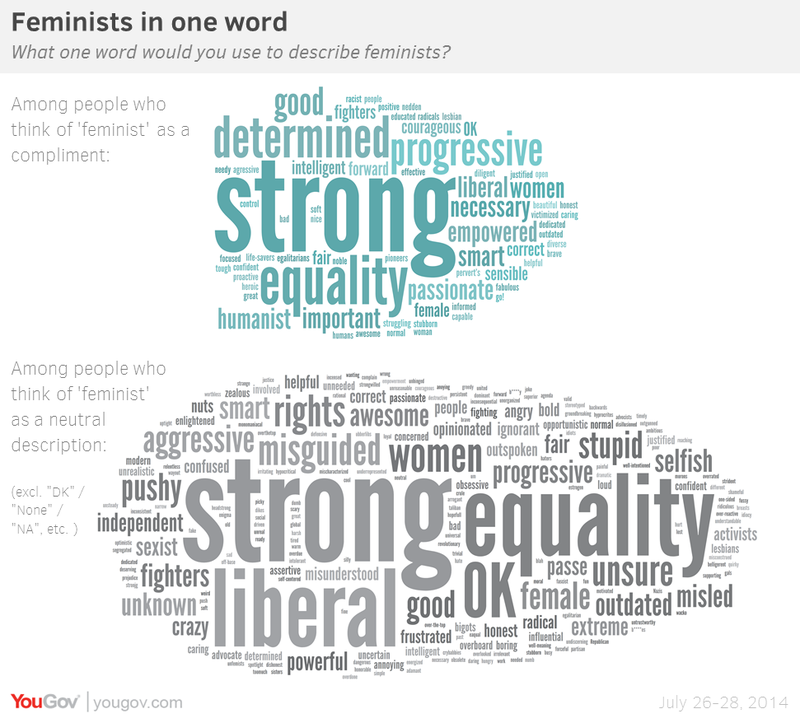 Those who say “feminism” is a compliment most often use “strong” as the best word to describe it. “Progressive,” “determined” and “equality” are also popular. 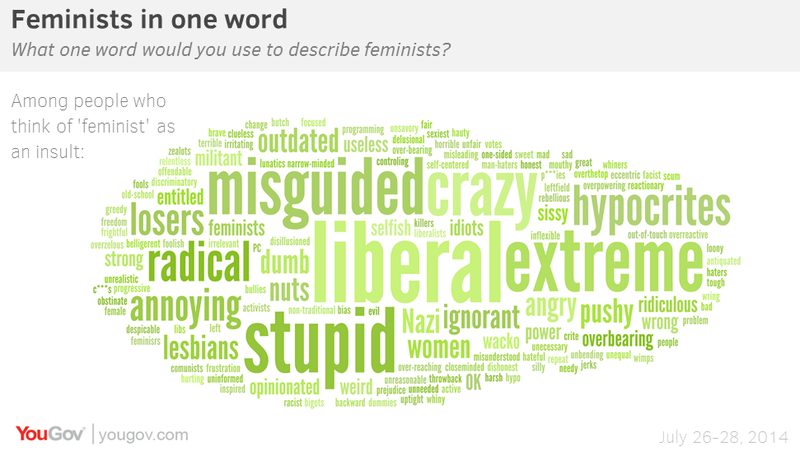 The word cloud for those who see feminism as neutral displays many of the same words as the positive cloud does, though “liberal” and some negative words also appear, but less often than among those who think the term is an insult. While the use of the term “feminist” divides Americans by party and by gender, there are some areas of wide agreement that show changes over time. In the 1930’s and 1940’s Americans disapproved of a married woman working if she had a husband who could support her. Those opinions had turned around by 1970, and now, fewer than one in ten Americans say they disapprove of a married woman working outside the home. 15% of those 65 and older disapprove, but that is a small pocket of resistance. Americans also agree that it is harder to be a mother today than it was when they were children. That is an especially strong feeling among the oldest group, whose childhood was longer ago. 75% of those 65 and older believe it is harder to be a mother today than when they were children, something just 43% of adults under 30 agree with (a third of young adults say not much has changed in this regard since they were children, one in four say being a mother is easier now). But Americans disagree on what a mother with children should be doing. 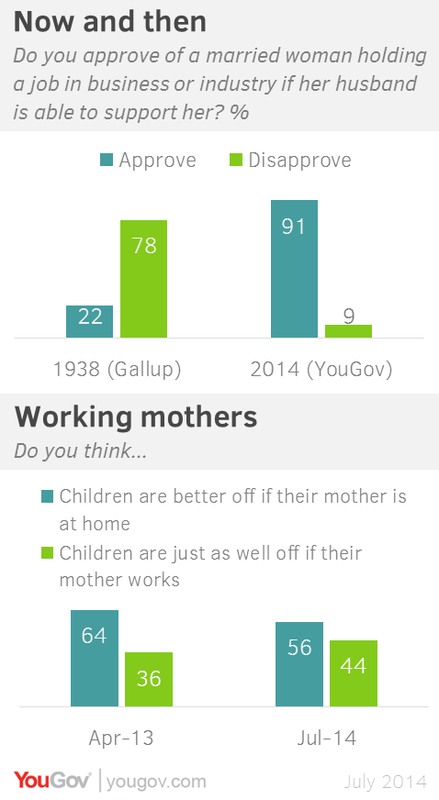 A majority believe that children are better off if the mother stays home with the children and doesn’t work. But that percentage is down from last year, when nearly two-thirds agreed. Men favor women with children staying home by 20 points (60%-40%); women are closely divided (52%-48%). Feminist women disagree by two to one (34%-66%).